Travel in style with this stylish brown rolling bag, carryon or rolling briefcase with spinner wheels. Grab your laptop, iPad, tablet, books, files and off you go! The perfect rolling tote, mobile office or briefcase for work, school and travel. ---------------------------------------------------------------------------- Description - Teacher rolling bag - Rolling bag for work - Rolling file bag - Rolling catalog case - Rolling shopping bag - Briefcase on wheels - Roller laptop bag - Nurse rolling bag - Rolling tote, women's laptop totes or luggage. rolling briefcase, roller briefcase, ladies laptop bag, wheeled briefcase, rolling computer bag, jkm and company, briefcase on wheels, briefcase with wheels, briefcase spinner, rolling laptop case. ------------- Mother's day gifts, mother's day gift from daughter, mother's day gift for mom, mother's day gift for grandmas, mother's day gift for her, mother's day gift from son, mother's day gift for sister. 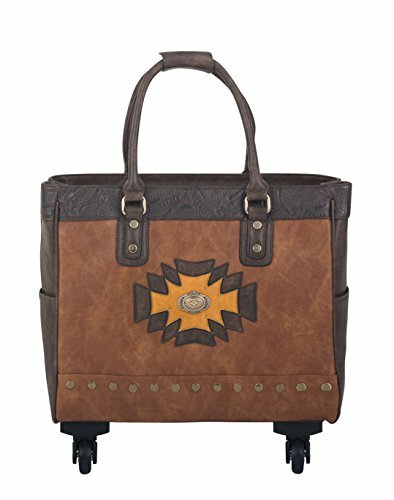 Brown vegan faux leather & tooled style faux leather exterior. Spacious laptop computer carryall or rolling briefcase bag. Makes a lovely overnight or weekender travel bag too! Antique brass color hardware. Two side pockets plus a back side exterior zipper pocket. Removable padded pocket will fit your tablet, iPad, 12", 13", 14", 15, 16" or 17" laptop. **Laptops are measured corner to corner diagonally. ** The main compartment of the bag will fit up to a 18" inch (45.72cm) laptop (measured corner to corner diagonally). If you place your laptop in the main compartment of the bag, we suggest using a laptop sleeve for added protection. The padded laptop pocket can be easily removed to make a larger interior space. Fully lined spacious interior with a large zipper wall pocket plus two open pockets. Zipper top closure. Pull out black retractable handle & four (4) multi-directional spinner wheels for easy mobility. If you have any questions about this product by JKM and Company, contact us by completing and submitting the form below. If you are looking for a specif part number, please include it with your message.